Thank you for your continued support. We completed our first sign language class and are now into our second group of students. We are teaching two classes: beginner and advanced. In the advanced class the students are beginning to think through when they would each be available to interpret based on their other responsibilities in the church. Up until recently they have all been talking about how to avoid ever having to interpret. We have made some great contacts in the Deaf community, but we have not seen any Deaf from the area in church yet. I just finished a sign language class at the deaf association in town. Because of the class, I have been involved in a couple of community events that have helped us get acquainted with more Deaf. A couple of weeks ago the deaf community sponsored a fund raising event for a homeless shelter that we were able to participate in as a family. There is another event at the end of November that I will attend. I look forward to meeting new Deaf and inviting them to church. I am still working with my friend Victor. I am not sure where to go from here other than keep showing him the love of God and praying for him. I have talked with his wife, who gives a salvation testimony, and she is glad that I can share God’s Word with Victor. His wife told me that Victor’s attitude is that God will just have to accept him as he is, or not accept him at all. He is too proud to ask Jesus Christ to provide salvation for him. He feels he must save himself or accept the consequences. The frustrating thing to me is that Victor is a kind and loving man. Socially he has done many good things. For him to accept that he cannot save himself is for him to say that all the good things he has done have no value in eternity. He does not understand that no matter how many good things we have done, we are still sinners before a Holy God who is ready to forgive us and save us if we are willing to accept His work on our behalf. A radio station was recently donated to our church. Victor’s wife is excited about listening to the station and learning more about God’s Word. Victor said he would listen too. I pray that they do and that God will use this new opportunity to reach Victor, and many others, with the Gospel. Thank you for your continued prayers and support. We understand that the economy is tough on everyone and therefore are thankful for the continued support. We appreciate the extra gifts even more than normal since we know it is a greater sacrifice for those of you who are supporting us financially. We wish you a great Christmas season this year. As you celebrate the upcoming holidays, continue to pray for missionaries around the world who are separated from their families. We made it through our first winter in South America. Winter? That’s what happens when you go south of the Equator, everything gets turned upside down. Even the calendar. I had a great trip to Las Vegas for the Deaf Nation World Expo. There were over 23,000 people in attendance for the event. Our team of 34 gave out 24,000 tracts and 16,000 Gospel DVDs! During the week we saw 11 people saved. Since the week ended we have gotten reports of others who have come to know the Lord through the literature and videos. We trust that the Lord will continue to do a great work through the materials we put in the hands of the Deaf and hearing we met in Las Vegas. We started teaching sign language classes in the church in Argentina. The students are learning well. While they are struggling with the idea of actually communicating and interpreting, I know the Lord can give them abilities beyond their imagination. I have seen the Lord do it many times in churches in the past. I pray for the students that God will continue to work in their lives and minds to learn as necessary. I encourage you to pray for them as well. This is why we are here—to train people to reach the Deaf with the Gospel through sharing God’s Word in signs. We look forward to upcoming activities that will help integrate our sign language students with the Deaf community. We have an invitation from another church to start a Deaf ministry in their community. We have certain goals that we would like to accomplish in our time here. That particular church could be used to accomplish 2 of our main goals. Pray that the Lord will give us wisdom in working out the details with the church to start that ministry and train another sign language teacher. Previously I mentioned that I have been working with a bike repairman named Victor. I have not seen Victor accept the Lord yet, but he continues to accept literature from me and says he enjoys reading it. Like so many people we have met here, he does not see why he needs a Savior. He does not think he has done enough wrong to be sent to Hell. Victor feels that God will accept him because of all the wonderful things he has done in his life. He is very proud of his many social accomplishments and does not think he needs to humble himself before the Lord. Victor says he has always rejected religious people because they have been more interested in preaching at him and not loving him as a person. However, he appreciates the time I spend with him and his dear wife as friends. I pray that showing him God’s love will help him turn to the Lord before it is too late. Thank you for your prayers and support. While we are accomplishing God’s work by laboring physically on the field, you are needed to do a spiritual work through prayer. Thursday afternoon was the official close of the DeafNation World Expo event. We don’t have all the numbers yet, but we did pass out multiple thousands of tracts and Gospel DVDs. The team has seen 11 people saved so far this week. We still have one more full day of ministry left. Even though the one event ended Thursday there are still other smaller events for the Deaf that continue into Monday. Sunday night we plan to return to the event that kicked off the week for us and continue to distribute tracts and DVDs. Even though the Gospel DVDs are specifically for the Deaf, they are a tremendously clear representation of the Gospel for the hearing as well. On the final day of DeafNation I prayed and asked the Lord to allow me to lead a deaf person to an understanding of salvation that day. 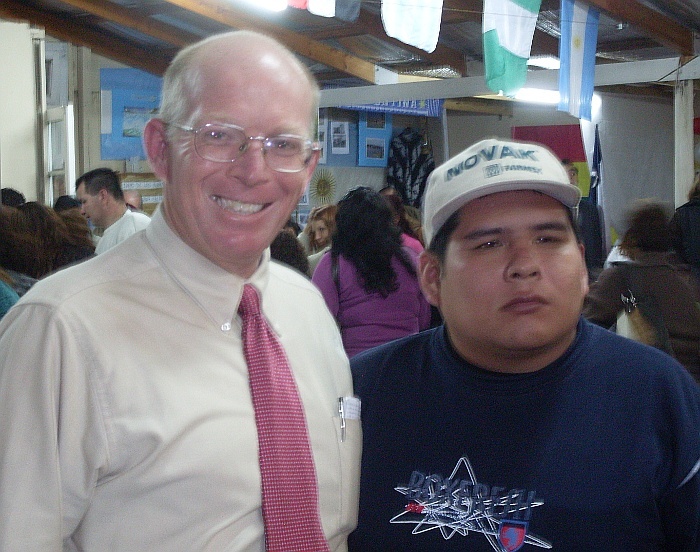 I really wanted to meet someone from Mexico and share the Gospel with them. About mid-morning I was told that there was a deaf man from Mexico who stopped by one of our booths. No one was able to communicate clearly with him. We started a 2 hour hunt to find the man in the crowd. However, we didn’t have to find him, he found us. He wandered back over to our table and I was able to meet with him. He is from Guadalajara, Mexico but did not know Mexican signs well. He also did not seem to know American Sign Language either. However he seemed intelligent and was able to communicate his level of understanding the Gospel when I presented God’s Word through pictures. It was my privilege to introduce him to the Savior standing in the aisle of the Sands Convention Center. I appreciate your continued prayers as I will be in Las Vegas a couple more days. There is also still a financial need associated with the trip. God provided through the graciousness of others to pay for my expenses while in Las Vegas, but I still need about $1000 to finish paying for the plane ticket. The cost of the trip was worth being part of a team effort to reach the Deaf. The team leader has encouraged us to see that this trip does not end here. Of our 34 person team, we are eager to see some follow the Lord into full time missions to the Deaf as a result of being in Las Vegas for DeafNation World Expo. 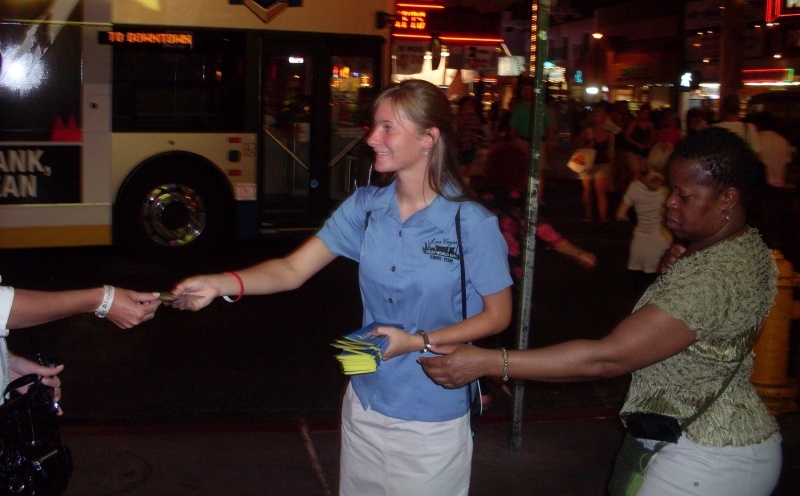 We opened up our ministry at DeafNation World Expo by passing out tracts at “The Freemont Street Experience.” We had 15,000 tracts available for the evening. We are not sure yet how many we were able to distribute, but they were very well received. Our group is separated into 5 teams–one of which was responsible for picking up any tracts they found on the ground. Out of the thousands that we did distribute, there were fewer than 100 thrown on the ground. It was an amazing reception by both the hearing and Deaf. These tracts were printed especially for this week. On one side the tract had information about DeafNation and some of the events for the week. On the other side was a well written presentation of the Gospel that used information specific to this conference to get the reader’s attention. As you can see in the picture, there were people actually coming to our team members asking for the tracts. One man said he was a teacher in another country and asked if he could have a stack to take back to his students. We even had another Christian ask for a stack of tracts and helped us distribute them! Thank you for your prayers for this week of ministry. Tomorrow we start distributing literature at 3 different booths and on the streets. Continue to pray for this tremendous opportunity that we have to share God’s Word with the Deaf. Tomorrow morning (Thursday July 15) I will be leaving my house headed to the airport in Buenos Aires, Argentina. It will take me more than 24 hours from the time I leave my house in La Plata to arrive in Las Vegas, Nevada. Finances for the trip. There is still a great need, but am trusting the Lord to supply everything. Most of the team will arrive on Friday. The event does not start until Sunday, but we will be doing a lot of preparation of materials and logistics the first 2 days. The team members are made up of some very experienced men and women in the ministry as well as lay people and college students. The opportunity we have within the team to influence the lives of other team members is a tremendous blessing. Outside of all the witnessing we will be able to do in Las Vegas, we have a chance to shape the lives and ministries of these young people. I will try to update the site every few days on the trip. I do not plan to send regular updates to my prayer letter mailing list during the trip, so please keep your eye on www.dpeach.com for the latest news. A special thanks is extended to those who have donated financially. Because of your monetary connection, I know you will be praying more earnestly for the results of the trip. I hope these updates will be a help to you in prayer. Thank you for praying as we have gotten settled in. We are now very actively ministering to the people around us. We are learning the sign language well and building relationships with the Deaf in our community. In just a couple of weeks we will begin teaching a sign language class in the hearing church. We have already had one deaf man visit the church which helped create a desire in the church members to learn sign language. I am spending quite a bit of time with a hearing man trying to share the love of Christ with him. 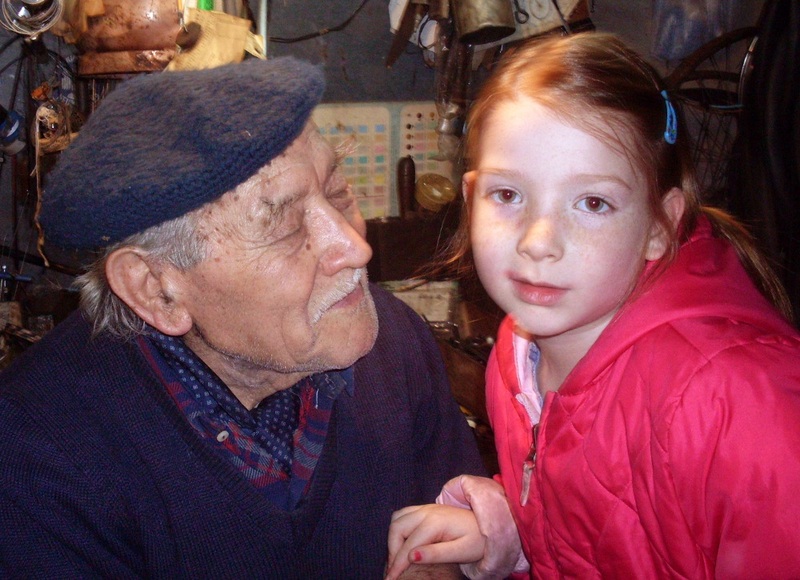 Victor is 86 years old and sees no need for the Bible. Because of a mutual interest in bicycles—he has been in the bike business for more than 70 years—we have built a good friendship. Pray that I will show God’s love so that he can open his heart to the Gospel. I spend 2 or 3 nights a week over at his house tinkering with bikes and sharing with him about my ministry. In July I will go to Las Vegas for the Deaf Nation World Expo. The event coordinators are expecting 50,000 Deaf from around the world at the event. I will join a team from Silent Word Ministries to distribute tracts and Gospel DVDs. Imagine the witnessing opportunity we will have with 50,000 people who are gathered for the sole purpose of interacting with strangers. The cost of the trip is $2,200. Some friends have already grasped the tremendous opportunity we have and pitched in to make the trip possible. You can get more information on how you can be a part of the effort at www.dpeach.com. Every few months I send out a packet of prayer letters from national pastors who work with the Deaf. I share these letters with churches and individuals who have shown an interest in praying for deaf ministries around the world. If you would like to receive these letters you can send me an email and let me know your address. I can mail the printed letters to you or send them in PDF format over email. Thank you for partnering with us in prayers and finances to reach the Deaf both here in Argentina and around the world. In July I will take part in an evangelistic effort in Las Vegas, NV called Deaf Nation World Expo. 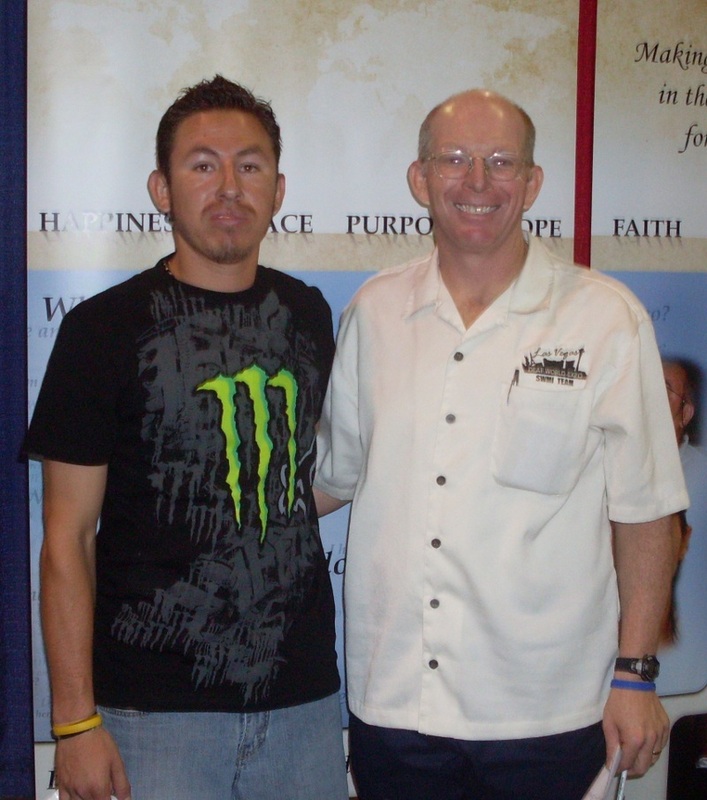 I will work with a team from Silent Word Ministries to distribute tracts and conduct one-on-one evangelism. An estimated 50,000 Deaf will be at the Expo. To learn more about the Deaf Nation trip and ways you can help prayerfully or financially take a look at the special page I have set up for the event. The last couple of weeks I have been working with an autistic man trying to teach him his need for salvation. Gilber is from Peru and is in Argentina visiting his brother. He traveled with several family members and will return to Peru in a few days. Gilber is 26 years old. He is not Deaf, but does not speak very much. It is sometimes hard to know how much he is learning and understanding of what he is taught. I have taken my time with him trying to help him understand salvation. There was a time in my work with him that I was not sure if I would be able to continue due to lack of understanding, however I spent an hour with him yesterday and God has given me hope for his soon salvation. I left some of my teaching pictures with him so that he could play with them and tell his family the story I have been trying to teach. Tonight at church (our church is having a missions conference) Gilber’s sister-in-law told me that Gilber has all the story memorized. That was exciting to hear. My next time, and probably last time, to work with Gilber will be Sunday morning. I am praying that God will open my understanding so that I will know how to proceed with Gilber so that he understands his need of the Savior and will accept the Lord that morning. Will you pray with me? UPDATE: I spent an hour with Gilber teaching him the Gospel yesterday. My prayer is that he understood. He has typically shown an understanding several days after I teach something to him. I left our time together yesterday somewhat disappointed. I did not have the confidence that he did understand and accept the Lord. However, I am encouraged to know that God will continue to work in him. My prayer now is that God will give me or the family a confidence that Gilber accepted the Lord or that when he does we will know. Thank you for your prayers. Gilber leaves this week going back home to Peru, but the family is talking about returning later this year. I look forward to seeing Gilber again. It is hard to believe we have been in Argentina over a month already! We are helping two works: one to start a deaf ministry in a local church and the other to help plant a deaf church. Up to now we have spent all our time in the hearing church since the pastor of the deaf church is away on a trip. We begin working with him as soon as he returns. The deaf pastor recommended that we work with the hearing church pastored by Missionary Jeff Bush. God worked in the church long before we arrived to instill a great desire to reach the Deaf in La Plata, Argentina. Every time we are at church we get asked about when we will start sign language classes so that the church people can get involved. As we are still learning the language ourselves, it is heartbreaking to have to tell them that it will be a few more weeks. Our main need and prayer request in the work right now is simple: we need to learn the sign language quickly so that we can communicate with the Deaf around us. We have met many Deaf while on buses, trains and walking around town. I give them a tract with the church information on it and write that we have a ministry for them. Until we learn the language we only have brief conversations. Finding the Deaf has not been hard here; they seem to be all around us. When looking for a house we wanted to find a furnished home that we could move into without having to buy (and later get rid of) much furniture. Other missionaries informed us that a furnished home was either unlikely or impractical since there are few and the ones they had seen were quite a bit more expensive per month. Plus, the quality of the furniture would not justify the extra cost. At the end of our second house shopping day we found one for a fair price. However the owner had a problem—he had more furniture than would fit in his new house. As a help to him, he asked if we would keep the furniture in our home at no extra cost! We thank the Lord that He led us to this house. Even though we found the house on our third day in Argentina, it took another three weeks to complete the paperwork. We are just now getting settled. However the “homeless” time allowed us to visit some cities nearby and share our goals with other churches. We pray that these churches will also have a desire to reach the Deaf around them. We appreciate everyone who helped us get to Argentina through prayers and finances. We excitedly carry out the task that you have entrusted us with. PDF version of the letter. We have been in Argentina a little over a month. We found the house that we eventually rented on our 3rd day here. But it took us almost 4 weeks to take care of the paperwork and be able to move in. While we were frustrated by this, we hear that we were fortunate since it normally takes 2 to 3 months for a rental agreement to be signed. We have met Deaf in various places. Just after trying to talk with a deaf man on a train, a deaf girl walked into our train car with her dad. I was not able to speak with them, but it was a reminder that even though we cannot communicate with the Deaf around us yet, they are still there. A few days later I met 2 deaf teens on a bus and was able to talk with them briefly. In all we have met about 15 Deaf and have friends in the church who can put us in contact with several others. We have been learning some signs and are eager to put them to practice in teaching the Bible. While we are working on getting started with the Deaf, we have been involved with a wonderful church in La Plata. I can’t say that I have agreed with every aspect of every church we have ever worked in, but I might be able to say that about this church. God is allowing us to carry out our ministry in a church that completely supports what we are trying to accomplish and I can fully support their program. The transition of working in a new country has been made easier because of the people we are privileged to work with. Thank you for your prayers as we get settled in and get to work on the front lines.